While it contains all the elements of a classic and timeless design, this luxury Cartier ring has a fresh contemporary feel that will set you apart from the crowd. This wide ring features three diamond-studded rows. Unlike more traditional designs, however, each row is made up of horizontal bars that give the ring the appearance of being made up of links. Watch lovers and luxury collectors will be particularly drawn to this edgy design. 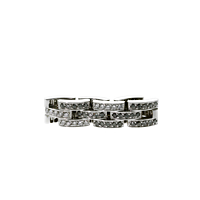 Round brilliant cut diamonds are pave set in each white gold link, creating a three-tiered modern eternity band like no other ring you will find.